I think the Seashell Snack sets in both Moroccan Amethyst and Capri Blue are attractive. I like to call the Moroccan Amethyst ones “Plume” because they remind me of big ostrich plumes women used to wear in their hats. 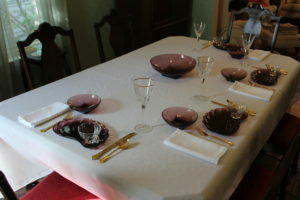 This table setting features my Moroccan Amethyst snack set (thrift store). I used my Golden Royal Plume flatware by Wm. Rogers and Son (antiques shop in Butte, Montana), because I thought it went well with the “plume” pattern. A Moroccan Amethyst Salad Set (thrift store) served as salad or soup bowls and a centerpiece. I love the mid-century modern design! Stemware is Cassandra Gold by Cris d’Arques, and the pattern in the glass goes so well with the snack set, and the gold trim ties everything together. This set is best shown on a plain white hemstitched tablecloth (Walmart) and matching napkins for a more formal effect. For a less formal feel, try using napkins that match the pretty purple color! Moroccan Amethyst Seashell snack set with Colony salad set.